Get out your flared jeans, platform shoes and hair spray because Disco Spins from Net Entertainment is here and it’s here to stay. The game is designed to put you in mind of the 1970’s dancehall that all of your favourite cheesy classics originated and Net Entertainment have done a fantastic job on this front. From the dance floor style tiles that make up the reels, to the disco ball scatter feature, every detail of this game has been carefully thought out and skilfully implemented. 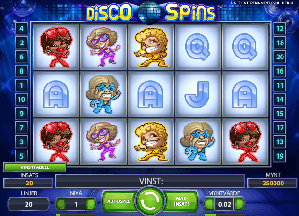 The game experience of Disco Spins is seamless and visually rewarding and if you couple this with the pretty good array of special features that it offers then you have a slot based game that will have you entertained until the small hours of the morning. With a stake range from 20 cents to 200 Euros, any player will be able to play to their budget and give them self a “reel” chance of some serious winnings. The classic combination of 5 reels and 20 fixed paylines is by no means groundbreaking, but why break away from a winning formula. The truly interesting feature in this game comes in the form of a disco dancing induced Wild Feature. If the disco dancers colour matches the colour of the tile on which it sits, a Wild symbol will appear and your potential winnings will increase. Considering up to 8 different Wild symbols can appear at any one point it doesn’t take long before your potential winnings have really ramped up and you are somewhere in that grey area between money fever and disco fever! As well as the Wilds feature, there are two variances of Free Spins features in this game. A regular Free Spins feature whereby you get anywhere upwards of 15 free spins and a triple winnings multiplier, and a Disco Spins feature where the reels will only include dancers and scatter symbols, increasing your chances of a winning combination. Both of these free spin modes are activated by the scatter symbols, which can appear on reels 3, 4 or 5. Get three scatter symbols, which are little disco balls, and you get a choice between the two free spin modes. As per usual, scatter symbols increase your number of Free spins, regardless of the game mode. As can be expected, Disco Spins is available in a mobile version that looks and works just as great as the online version. It’s available on both major smartphone operating systems, iOS and Android, and you can also play it on your tablet. Disco Spins is available at, among others Guts, Comeon, Redbet, Mr Green and Unibet. The list is however considerably longer than that and if you want to play it at your favourite casino, just search their selection – it is bound to be there. One for the nostalgic gamer out there I reckon. The game is very well designed and thought out, with a good fast pace and a cracking soundtrack. The only downside is a slightly smaller grand jackpot than you would tend to find on Net Entertainment slot games, but hey, they can’t all have life changing jackpots, sometimes you just need to get your groove on and enjoy the experience.